The University of Sunderland does not offer Business Management. 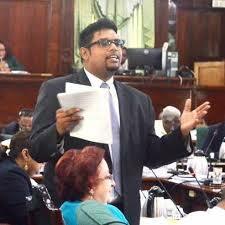 However, based on his certificate, former Minister of Housing, Irfaan Ali pursued “Business Management” at the institution and secured a “Bachelor of Arts second class honours” in 2006. This, in addition to the fact that his name is incorrectly spelt on the certificate, is raising more questions about the authenticity of Ali’s qualifications. According to the University of Sunderland, it offers a first degree in Business and Management. The University offers BA (Hons) Business and Applied Management, BA (Hons) Business and Financial Management, BA (Hons) Business and Applied Financial Management, BA (Hons) Business and Human Resource Management, BA (Hons) Business and Applied Human Resource Management, BA (Hons) Business and Marketing Management, BA (Hons) Business and Applied Marketing Management. Also, all the business courses offered are full time and are only offered on campus or at an associate learning institution in the United Kingdom. There is no online offer of the business programmed. Ali’s Sunderland degree in “Business Management” was reportedly attained in 2006. However, in 2012, when Ali sued Kaieteur News over an article written about his mansion and pool house, he submitted an Affidavit to High Court saying he has a first degree in “International Business” as opposed to “Business Management” as stated on his certificate. Interestingly, Ali is yet to graduate with his PhD which, according to his sworn Affidavit, he was already signed up for since 2012. In 2014, Ali was Guyana Times, ‘Person of the Year’. Also, Ali was very selective in naming the institutions he attended. While he listed the local schools he attended, the then Minister named only two of the foreign universities he reportedly attended. Also, back then, two years after he said he registered, Ali said that he was pursuing his PhD. 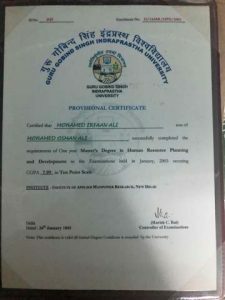 When he was contacted by this newspaper last Sunday about the fact that, according to his documents, he attained his first degree three years after receiving his Master’s, Ali indicated that he is yet to graduate with his PhD. This means, seven years after registering, Ali is still to graduate from the PhD programme that he is pursuing. Last Sunday, this newspaper wrote that documents suggest Ali may have used a fraudulent transcript to pursue a Master’s Degree programme at an Indian University. Information suggests that Ali secured his Master’s on the basis of a first degree from a University that did not even exist. Among the certificates in the dossier was one from the Guru Gobind Singh Indraprastha University of India. That certificate indicated that, “Mohamed Irfaan Ali successfully completed a one year Master’s Degree in Human Resource Planning Development in the examinations held in January 2003. However, the documents provided to this newspaper suggest that Ali defied the odds. Ali secured his first degree some three years after his Master’s. While in India at the Guru Gobind Singh Indraprastha University to do his Master’s, Ali presented, among other things, a transcript from the Chamber Business School. That school was supposed to be located on West Demerara. One Joshua Shafeek was the President of the West Demerara Chamber and Commerce at the time and the transcript was signed by him. While the Business school was registered, it was never accredited neither did it ever offer degree programmes. 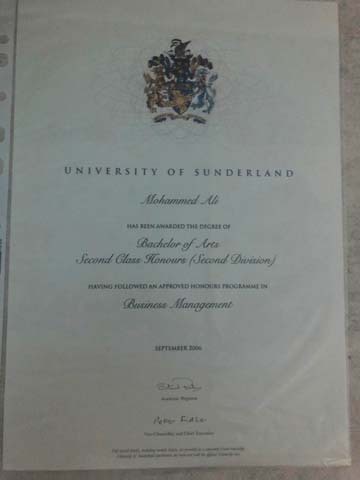 The Certificate from the University of Sunderland said that, “Mohammed Ali was awarded the degree of Bachelor of Arts, second class honours having followed an approved honours programme in Business Management.” This was in September 2006. Of note is the fact that the names on the two certificates differ. Ali’s first name “Mohamed” is spelt with two “m’s” on the first degree certificate. Ali secured a certificate of participation for the Human Resource Planning and Management Programme from the University of West Indies. This was 2001. Ali also has a one-year postgraduate diploma for the All India Institute of Management Studies, which he secured in 2002. Since news broke about the inaccuracies with Ali’s qualifications, several academics took to social and mainstream media with commentary. Dr. Mark Devonish said that he has done some research of his own. His research indicates that Sunderland does not offer business degrees online. Also, Dr. Devonish pointed out, “Irfaan Ali claimed he did a postgraduate certificate in Finance at the Anglia Ruskin University. I also called their admissions department on +44 1245 493 131 and was advised that there is no postgraduate certificate in finance.